Smithsonian Folkways is making more than 300 standout albums (over 5,500 tracks) from the famed Arhoolie Records catalog available digitally and on CD through the Smithsonian Folkways website starting October 21 (folkways.si.edu/arhoolie). The remaining titles from the roughly 650-album collection will be released on an ongoing basis. Arhoolie Records is best known for "down home" blues, jazz, country, gospel, Cajun, zydeco, Mexican-American, and world music. Smithsonian Folkways acquired the Arhoolie catalog in May 2016 from its founder Chris Strachwitz and his business partner Tom Diamente. It is the largest addition to the Smithsonian Folkways catalogue since it launched in 1987, bringing the total number of available tracks to almost 60,000. Arhoolie Records has a surprise release for today. Original 1965 recordings from the legendary Blue Sky Boys. Classic country brother duets by Bill & Earle Bolick. These songs are appearing for the first time on CD from the 1976 LP by the John Edwards Memorial Foundation. From the era of the beginnings of bluegrass the guitar and mandolin of the Blue Sky Boys is a refreshing new sound from the past. Arhoolie Records has announced the street date of May 22nd for the new self-titled album by Loafers' Glory. 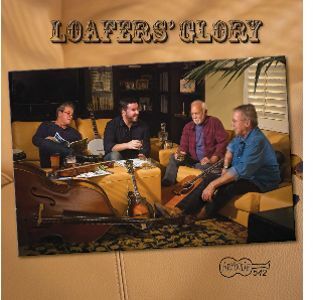 Loafers' Glory may be a new band, but its members, Herb Pedersen, Bill Bryson, Tom Sauber, and Patrick Sauber are all veterans of the Bluegrass, Old Time Music and Folk music Scene. Loafers' Glory performs throughout the West Coast and will be playing the California Bluegrass festival circuit this summer.